One NIU faculty member, two students and an entire department were recognized for their outstanding contributions to international education during the 2018 International Recognition reception held Nov. 13. Jui-Ching Wang, associate professor in the NIU School of Music, was selected as the recipient of the 2018 Outstanding International Educator. Wang, assistant director of the university’s Center for Southeast Asia Studies, teaches world music courses and coordinates world music ensembles such as the Chinese music ensemble, Indonesian gamelan ensemble and Middle Eastern music ensemble. Purush Damodaran, Jui-Ching Wang, Brad Bond, Michael Yurkiv and I Younan An at the International Recognition reception held Nov. 13. The Department of Industrial and Systems Engineering was recognized for their significant contributions made to international education. Specifically, the department is lauded for bringing the perspectives of the world to NIU and the expertise of NIU to the world through international mobility of faculty, students, and ideas. Bond said the awards are typically given to those who are noted for their long-standing commitment to and success at internationalizing NIU. “That is certainly the case for Dr. Jui-Ching Wang and the Department of Industrial and Systems Engineering,” Bond said. 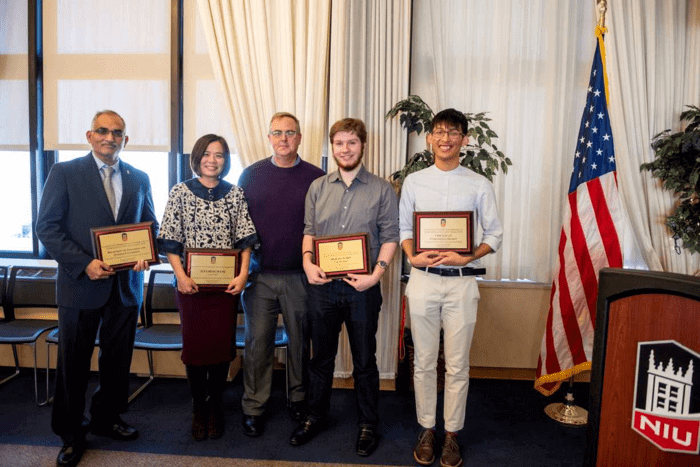 In addition to the faculty and department awards, the Division of International Affairs recognized domestic student Michael Yurkiv and international student I Younan An for their contributions in creating a greater visibility of global education at NIU. The students will each receive a $500 credit on their bursar account and a plaque commemorating the award. Previous Post:Eui-kyung Shin, a professor of Social Studies Education in the Department of Curriculum and Instruction, is celebrating the publication of a new book.